Thus, all the messages still actually live on your handset, they’re just shown to you on the Web as well. So your phone needs to be connected to the Internet while you’re using WhatsApp Web on your computer, keep that in mind. To access the new functionality, you need to have the absolute latest version of WhatsApp for your platform installed on your mobile device. Then you can head to this address from your computer, where you’ll see a QR code. WhatsApp says you should use Chrome. Other browsers may work, but to be 100% sure you’ll need to go with Google’s offering for now. The next step involves pairing the WhatsApp account on your phone to that computer. 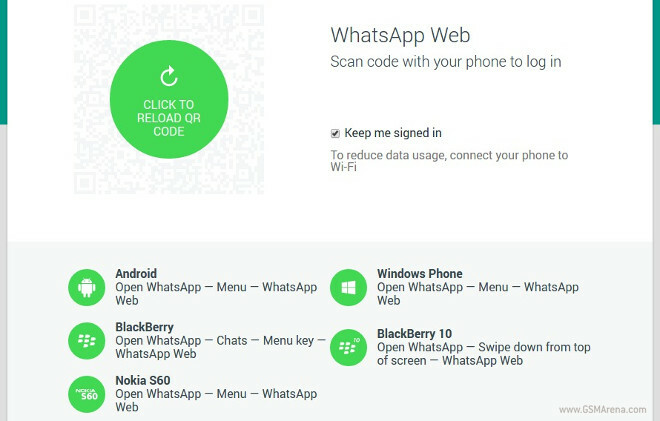 For this, you simply scan the QR code from within WhatsApp on your handset. This will be possible through a new Menu option, labeled WhatsApp Web. Instructions for all mobile platforms are provided on the WhatsApp Web page. If you don’t have that option in the app on your mobile device yet, then either you’re not running the latest version or the company hasn’t enabled the new feature for your account. This seems to be a staged rollout of sorts, so if you’re in this situation a bit of patience will help. WhatsApp Web is going to be available to you if you use the app on Android, BlackBerry, Windows Phone, or Nokia’s old S60 OS. Unfortunately the glaring omission in that list is iOS. WhatsApp says it can’t enable the Web client for people using iOS “due to Apple platform limitations”.